To ensure maximum performance, reduce system downtime, and make informed decisions as to Operation and Maintenance (O&M) services, renewable energy monitoring systems are being installed at Photovoltaic (PV) solar, wind, hydropower and other types of renewable energy power plants. Thanks to the monitoring system, system managers can be in full command of all the working facets of a renewable energy power plant. Renewable energy power plants are generating clean, green energy throughout the world. To ensure maximum performance, reduce system downtime, and make informed decisions as to Operation and Maintenance (O&M) services, renewable energy monitoring systems are being installed at Photovoltaic (PV) solar, wind, hydropower and other types of renewable energy power plants. These monitoring systems provide asset managers and investors with a robust tool to extrapolate data, access live feeds and historic data, trend projections and alleviate concerns in regard to production levels for their energy systems. The monitoring system is capable of managing any size facility, even systems less than one Megawatt (MW). It is an industrial technology offering system engineers a flexible, custom configuration for total control over their renewable energy power plant. The control system provide simplified, centralized, reliable and secure data management, essential in achieving maximum energy production. Access to real-time and historic data as well as anomaly alarm notifications enable technicians to provide effective, preventative and corrective maintenance of the renewable energy generating system in a timely manner. This complete, integrated technology solution eliminates the need for separate hardware and software companies, resulting in a single source responsibility for more streamlined, effective monitoring. Prior to installation, the monitoring systems’ factory integration and testing of the UL-listed monitoring solution ensures turn-key operation at installation. The robust, reliable engineering eliminates in-field install project delays and on-site troubleshooting issues which could result in additional costs. 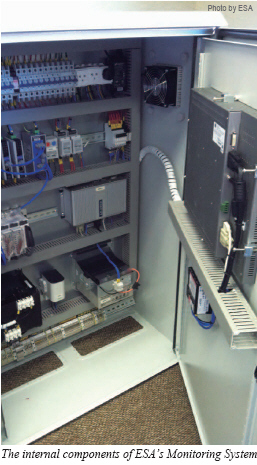 During the installation, industrial hardware utilizing Modbus communication is installed at the power plant in a custom cabinet to read the data and represent values from inverters, combiner boxes, and strings, as well as a very precise network analyzer. Real-time values, historical values and event logs can be consulted by the user for all electrical parameters relevant to the site. Current values are represented for each inverter, recombiner box, combiner box, string or panel. In addition to that, a site network analyzer is installed to monitor and to control the quality of the electrical source, looking at Total Harmonic Distortion (THD), voltage, current, power, energy and ground isolation values. An advanced CPU and hard drive disk are also installed to permanently backup data and store the information locally. In case of a power outage or power surge, a battery backup and surge arrestors keep the data secure until it can be uploaded to a central server thereby warding off information loss. An integrated data backup protocol provides additional protection of the data. Receiving the information from the power plants, the central server stores it and manages the user connections to the monitoring system. The monitoring system also includes a touch screen monitor which is integrated into the cabinet to allow personnel to extract data, as well as view the real time data, on the devices on-site. This gives the technicians the ability to carry out O&M tasks in a more efficient manner. A weather station is installed for the tracking of atmospheric conditions and includes an anemometer, radiation and temperature cell, as well as an ambient temperature sensor. A gadget with the forecast of the site location is also available on the program and visible on the main dashboard. All meteorological values cell are acquired and represented in the monitoring application. The radiation value and temperature are the most relevant data sources for the analysis of a PV solar power plant. Additionally, global irradiation is measured from a pyranometer device and two independent channels measure POA irradiation of cells in a PV installation. These readings will provide the technician with the correct information to determine if the system is producing within proper ranges based on the data provided from these sources. Capturing wind speed with an anemometer can be important because should high winds lead to system damage. For example, gusts of winds and flying debris during a storm could damage wind turbines or cause solar panels to dislodge from the racking system. The monitoring system will have recorded these wind speeds enabling the facility mangers to file insurance claims along with the metrological data the monitoring system has recorded from the incident. In addition to being able to provide the insurance company the required information, personnel can be aware of and repair any faulty equipment that may have been compromised by the storm as well as perform necessary clean up. The last two pieces necessary for the monitoring system hardware are a data acquisition card and a gateway. To acquire data for the analog signals of the weather station on-site, a data acquisition card is needed and the Modbus/ethernet gateway integrates the data acquisition card on the local network. 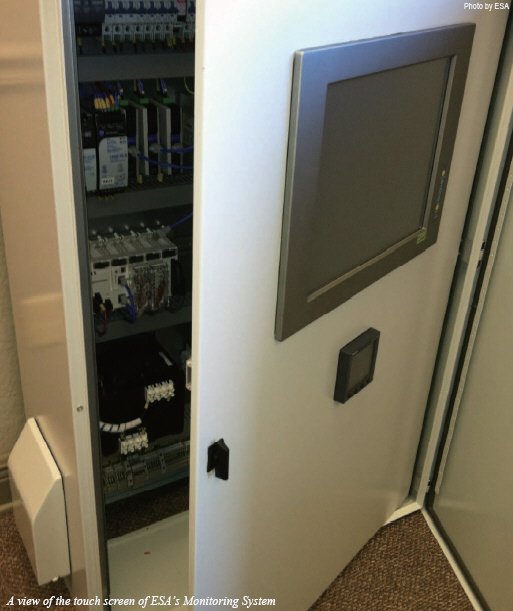 The monitoring system’s terminal server application enables users with a web based interface to access data by entering a username and password via the touch screen monitor in the secure cabinet. Users can also access the secure server and log in remotely to the monitoring system from anywhere in the world. All data and reporting capabilities available on-site can be accessed offsite as well. Additional users can be configured and granted various security access levels keeping sensitive data protected. Once logged into the monitoring system, the monitoring application consists of an initial screen with a general overview of the installation and all the pertinent data. At a glance, the users have access to instant systems performance ratios via a robust dashboard view. This graphic user interface enables the system engineer immediate access to pertinent, real-time plant data presenting values such as power, current, voltage, radiation, weather station data as well as historical data of the energy production. The information is available for each inverter, as well as the total energy of the power plant. T o facilitate the user in checking the status of the plants, a visual system color gradient has been designed. As different sections of the plant change in power production, the color gradient changes accordingly―indicating cloud cover, rain showers, or other weather conditions. These graphs indicate the power produced by the inverters at any time and allows the user to identify any problems inside the installation down to string level. The monitoring system design also allows the recording of historical data, which is stored locally as well as on the central server and can be represented graphically or in numerical charting spreadsheets. Daily graphs can be displayed which represent the essential parameters of the inverters―DC and AC power, current, voltage, radiation, and frequency. Energy reports can be imported into a spreadsheet format which display the energy of each inverter, the total energy of the plant, etc. Data can also be exported in spreadsheets for engineering analysis and other reporting purposes. One of the reporting capabilities the monitoring system includes is string level reporting. Capable of detecting and displaying variances in operating efficiencies, down to the string level, this feature of the monitoring system enables users to detect specific strings that are operating at a lower or higher efficiency level than their counterparts. For O&M purposes, maintenance personnel can visit the site and monitor or test the strings that indicate lower efficiency levels. For example, a user can access the system and search for string levels operating at a 3% variance. The monitoring system will display in green any strings that are operating at 3% above expected efficiency and will display in red and strings operating at 3% below efficiency expectations. This O&M and reporting tool expertly facilitates the system manager in keeping a watchful eye on the installation and direct his attention to precise areas needing preventative or corrective maintenance. A tutorial and hands-on training for the Graphic User Interface enables the user to know how to log in and how to find the data needed to insure the system is operational and performing at full capacity. Detailed documents including the software agreement, manuals, and software information are provided to the system managers as well. 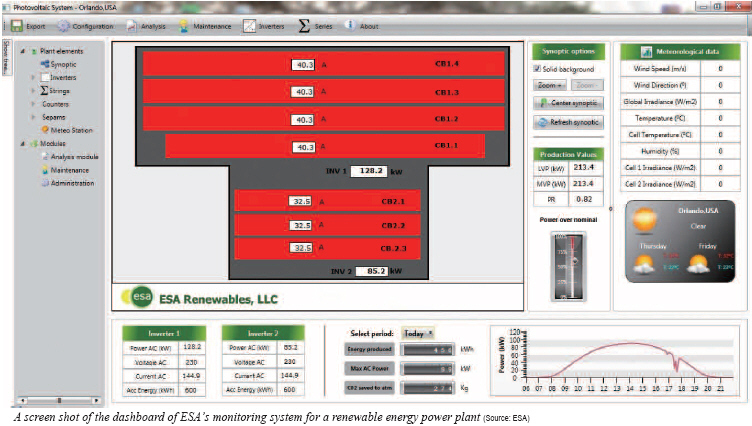 Additionally, for energy system owners managing numerous power plants, the monitoring system is also capable of integrating up to forty plants into one dashboard view. From an investment standpoint, this can be beneficial in that all assets can be combined into one simple form of reporting. Frequently, asset managers are forced to use different control systems for each installation based on an EPC companies preference for a monitoring solution. With numerous control systems to manage, this most certainly increases management time and eliminates the ability to integrate all data into one system for complete reporting capabilities. The monitoring system can be installed on each plant enabling asset managers to have complete control and only one reporting system. The monitoring system allows for customized configuration of system alerts for fast troubleshooting, maximum energy output and minimal expense. Not only do renewable energy facility managers have immediate access to pertinent real-time data from anywhere in the world, but they also have the ability to custom configure system alerts. With this feature, personnel can configure their alerts according to their own specifications. For example, if the system were to dip below a particular efficiency level, or if radiance levels or weather conditions reach a critical point, a user can customize an alert to be notified immediately of these changing circumstances. Anomaly alarm notifications automatically alert system managers to allow for quick response, to achieve maximum performance and minimize economic losses from outages. It is possible for these alerts to be able to identify the location of the issue down to the string level. A new module that was just recently released for the monitoring system enables users to track cost expenditures such as labor hours, travel, materials, and any other costs associated with maintenance. It allows the monitoring system the ability to generate work orders from anomaly alerts, track specific costs to that work order, and create trend projections for future costs and energy production based on historic trends. The monitoring system is capable of collecting and storing performance data including energy balances, display data loggers, power curves and astrological data for later analysis, simulations, and testing. This data is essential for effective preventive and corrective maintenance as well as trending projections. This control system has a historic database to analyze the energy produced every month, highlight differences between installations and inverters and report alarm history. In addition, the monitoring system has an internet client interface program, which enables personnel to receive data regarding the performance of the installation. This data is available at any time, securely, from anywhere in the world. The monitoring system comes with a two year standard warranty. After project completion, the monitoring system software is automatically upgraded and kept up-to-date, without service interruption, to meet the needs of the renewable energy power plant during the two year term. Extensions of the warranty term are also customizable to an installations needs. Maureen McHale is a Marketing Consultant with ESA Renewables (http://esarenewables.com). Located in Central Florida, McHale has been actively promoting the solar industry and green products for the past five years.